Though its roots were Canadian, Intrawest grew to become a major United States ski operator with resorts from Canada to Vermont. Intrawest owned and operated ski resorts for over 30 years until 2017, when it was absorbed into what would become Alterra Mountain Company. Intrawest dates back to 1976, when it was started by Joe Houssian as a Canadian real estate development company. Intrawest was officially formed by an amalgamation on November 23, 1979. Intrawest's first involvement in the ski industry came a decade later, when it purchased the recently developed Blackcomb Mountain in British Columbia from the Aspen Skiing Company in 1986. After going public, Intrawest's Canadian holdings continued to grow at the start of the next decade, when it acquired Mont Tremblant in Quebec in 1991. Two years later, Intrawest acquired Panorama in British Columbia. Intrawest entered the United States and New England ski industry in 1994 when it purchased Stratton Mountain from Victoria USA, Inc. Within the first few seasons of ownership, four high speed detachable six person chairlifts were installed. Intrawest acquired more United States holdings for the following season when it acquired Silver Creek and Snowshoe in West Virginia for a reported $40 million in November 1995. An aggressive investment plan was launched in 1997, starting with the installation of a high speed quad and significant snowmaking improvements. In 1996, Intrawest acquired a 31% stake in Mammoth Mountain, CA, plus undeveloped land. Intrawest increased its ownership share to 51% in 1997. Also during the fall of 1996, Intrawest announced it would acquire Mont Ste. Marie in Quebec. 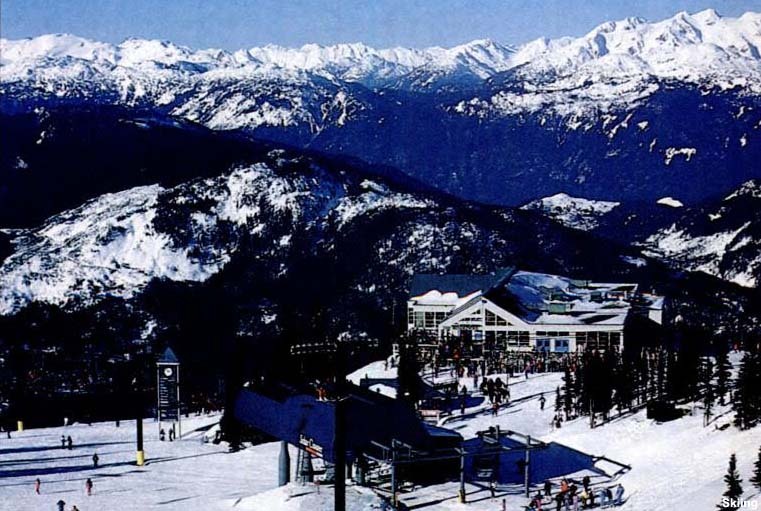 In March 1997, Intrawest announced it had completed a merger of operations with Copper Mountain and Whistler Mountain, the latter paving the way to creating the largest ski resort in North America, Whistler-Blackcomb. In February 1998, Intrawest acquired Vernon Valley-Great Gorge-Action Park out of bankruptcy, and rebranded the New Jersey resort as Mountain Creek. The company reportedly invested $20 million in capital improvements that off season. In July 1998, Intrawest moved to become a "Diversified Leisure Company" by acquiring Raven Golf Group, Sandestin Resorts, and 15.7% of the common shares of European ski area operator Compagnie des Alpes. In January 1999 Intrawest entered into an agreement to purchase a 50% share of Blue Mountain in Ontario with the hopes of developing synergy with its existing Whistler Blackcomb, Tremblant, and Panorama resorts. Intrawest announced the acquisition of the remaining 50% in 2014. Intrawest created a three-year business plan in May 2001, projecting break-even cash flow in 2002. However, citing "the slowdown in the economy, the fallout from September 11 and the difficult weather conditions in the East," the goal was not achieved. Instead, the company introduced "tight cost controls" and started to sell off "non-core assets." On February 1, 2002, Intrawest sold Mont Ste. Marie because of a "desire to free up management time." In December 2002, Intrawest became operator of Winter Park in Colorado. Working with the City of Denver, Intrawest secured a 50 year lease with an option to purchase base area land. Intrawest paid $3 million, plus annual lease payments starting at $2 million. In addition, Intrawest had to pledge $50 million in improvements. In the spring of 2006, Intrawest sold its controlling share of Mammoth Mountain to Starwood Capital. On October 26, 2006, Fortress Investment Group LLC purchased Intrawest for $2.8 billion, with Joe Houssian's retirement as CEO coming one week later. Fortress then went public in February of 2007. On March 1, 2007, American Skiing Company sold Steamboat to Intrawest for $265 million. Dealing with financial issues, Intrawest began unloading properties in late 2009. Copper Mountain was sold in December 2009, followed by Panorama in early 2010, Mountain Creek in May 2010, and some of its non ski area assets. Also around this time, Intrawest missed loan payments on its Whistler Blackcomb holdings, forcing the sale of the majority of the ski resort via a public stock offering in late 2010. Intrawest eventually sold its remaining 24% share of Whistler Blackcomb holdings to KSL in late 2012. On November 12, 2013, word emerged that Intrawest had filed for an estimated $100 million initial public offering. Trading New York Stock Exchange under the ticker symbol SNOW, 3.125 million shares were sold by Intrawest for $12.00 per share on February 5, 2014. Fortress sold 14.844 million shares, retaining the proceeds. On April 10, 2017, KSL Capital Partners and Henry Crown & Company (owner of Aspen Skiing Company) announced they would be acquiring Intrawest for $23.75 per share, for a total purchase price of approximately $1.7 billion. On July 31, 2017, KSL Capital Partners and Henry Crown & Company announced the completion of their acquisition of Intrawest. On January 11, 2018, Intrawest became Alterra Mountain Company.